← The Conservators Point of View: How do we assess things that are out of reach? We were recently asked by a developer to look at a large open air shed they are turning into retail space below and offices above. Since the project sought to use historic tax credit funding, they had many preservation entities to satisfy. 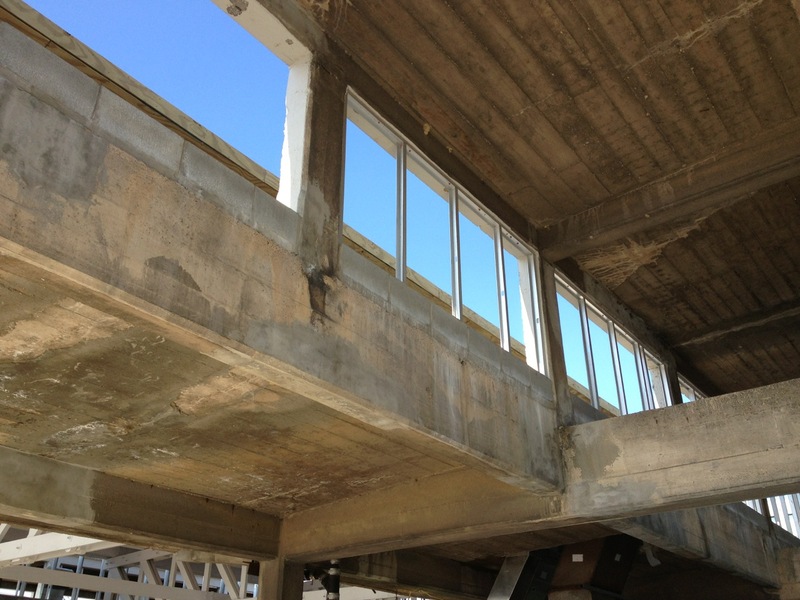 The developer wanted to sheath the building in glass, but otherwise leave much of the structure exposed. They needed our help interpreting what is unique and important about the structure. Historic buildings are always trying to tell us a story. While concrete structures are now ubiquitous, what makes this one unique? On our first visit, the interior was inaccessible, but we were drawn to the unique colorations on the mostly weathered paint surfaces. 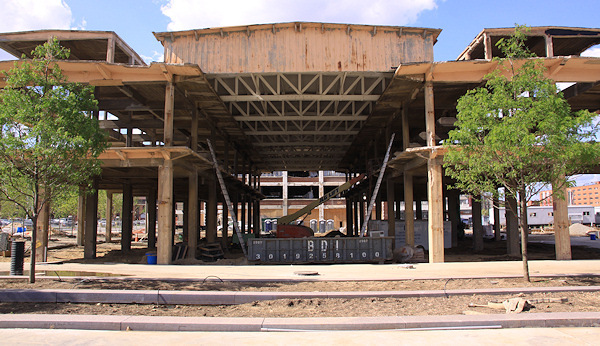 When we returned to look at the building again on a nice cloudy day, we could see the beautiful formwork with the wood grain clearly visible even 20 feet up on the ceilings. This very unusual structure looked like Greene & Greene construction or a Japanesque post and beam structure, only this time it is constructed of concrete. Built in 1918 when concrete construction was still developing the procedures for large-scale construction, we are able to see how the forms were constructed. As in all architecture that preceded it, we had the evidence of materials, tool marks and joinery to tell us how the building was constructed. 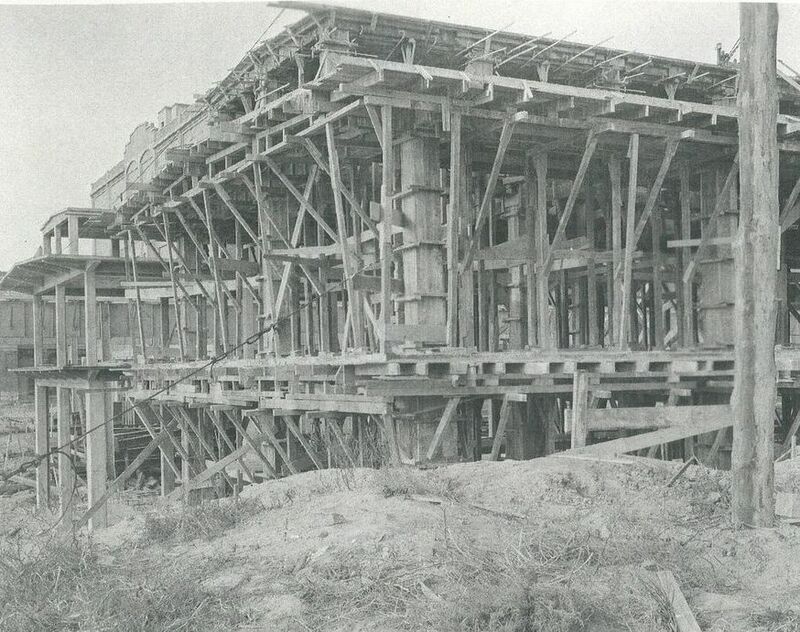 Unlike today when modular formwork systems are bolted together and reused, every piece of this structure was built in place by carpenters. 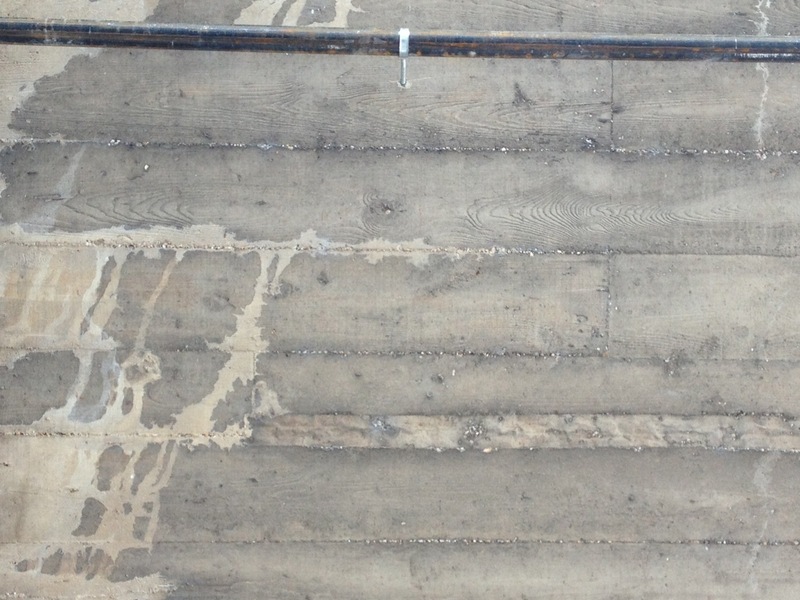 The real beauty here was that they used boards that had left the imprint of their grain in the concrete. There are both sash and circular saw marks visible. Early black and white pictures were available to show conditions at the time of construction. We wondered what we might learn from them. In unison with looking back at the building itself, the answer was quite a lot. We know in the 19th century concrete was often poured at a rate of only a foot or two per day. But it is pretty clear from this site and how the forms are built, that they were doing continuous pours of the 16’ tall columns or entire floors all at once. 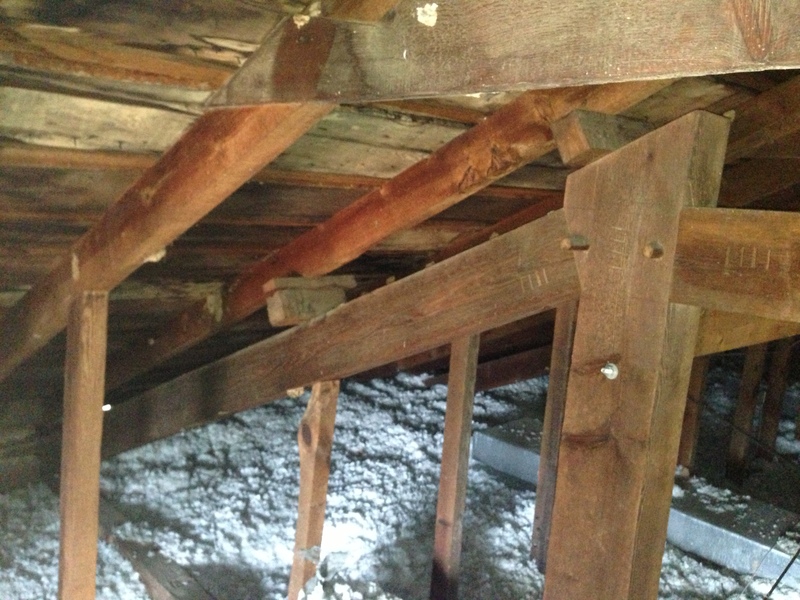 The pictures of the forms around the columns show a box made of boards with rangers (horizontal braces) to resist blowout from the extreme pressure on the forms (up to 600#/foot). 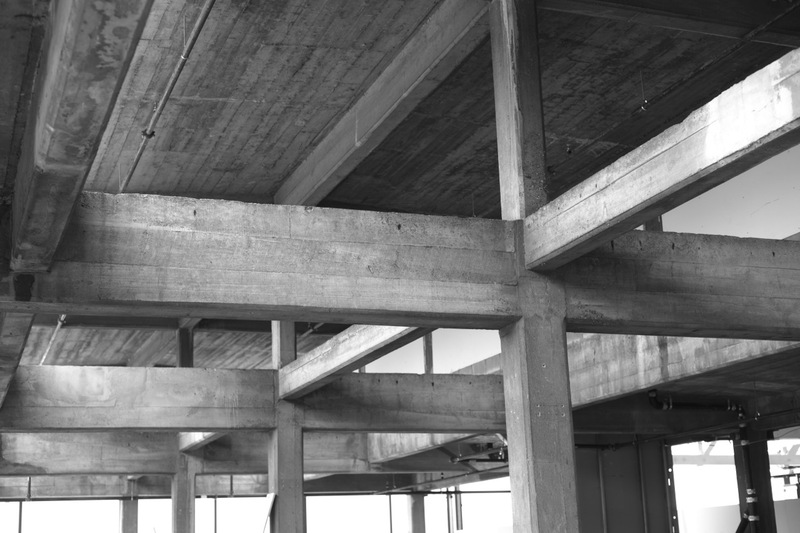 Whereas by the 1930s the formwork would be made of ⅞” boards, these look to have been created of 1-¼” material. The column forms were reused and thus most of them have much less grain visible. Form building at the time was complicated and expensive. Every effort was made to allow wood to be reused, whether attic sheathing, sub-flooring, or diagonal sheathing. The boards were rough sawn. In the 1910s it was common to plane a single side to establish a consistent board thickness. Occasionally we see where a board was reversed leaving visible planer marks. 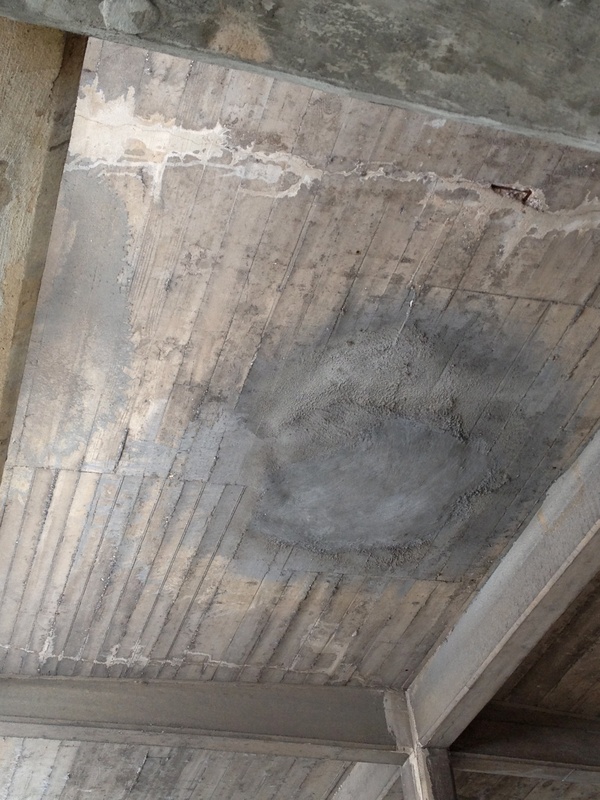 It was also common in concrete structures at this time that if the ceilings were going to be exposed, painted or oiled canvas was put on the upper side of the boards so they would have a smooth ceiling once the formwork was removed. 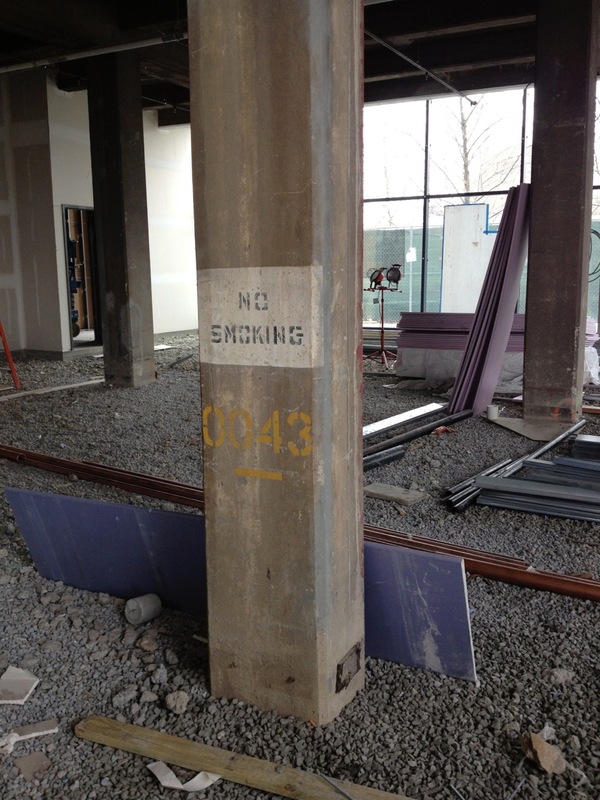 Since this was meant to be a utilitarian building, they did not bother with this step. The more we look, the more a building reveals how it was constructed. 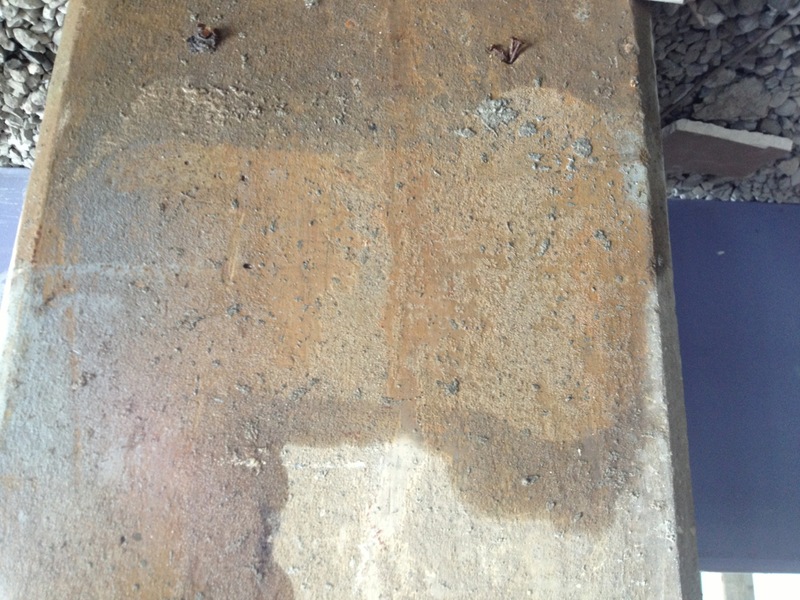 We began to see two things: an imprint of every board used in the formwork and an early paint history. We had discovered basically three colors on the building and initially thought we would clean the surfaces, stabilize the original paints and then infill paint to match where missing. But we noticed that almost everywhere – to one degree or another – one of the paints seemed to predominate over the others and on some of the columns where we suspected forms had been reused, we noticed the surface was very sanded and that this color was blended around the sand grains. This suggested something other than paint applied after the fact. It was common in the late 19th and early 20th century to oil boards as a release agent. By the 1930s trades books reference the inadvisability of oiling boards as it leaves a stained and mottled surface. 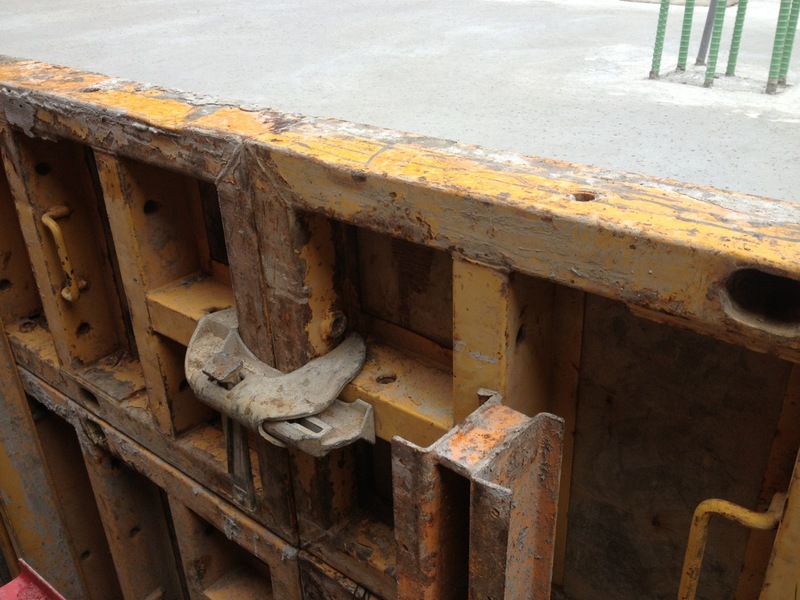 They comment that in the early days of concrete formwork when boards were oiled that crews often took the forms off too early. But at least the mid-1920s, most trades manuals had concluded that taking forms off early was inadvisable. Instead, since concrete shrinks, just by waiting the forms would separate on their own when the concrete was cured enough to support itself. We conducted an experiment by taking some boards with a pronounced grain, oiling them with linseed oil, and put mortar on the boards and let it set for about a week. Sure enough, the surface had a grayish tan coating on it once the mortar was removed. So what appeared to be paint appears to have been another remnant of the original construction process. The bases of the columns close to the perimeter were more yellow and faded out where the sunlight had hit them, but on the ceiling the color was more evenly gray. 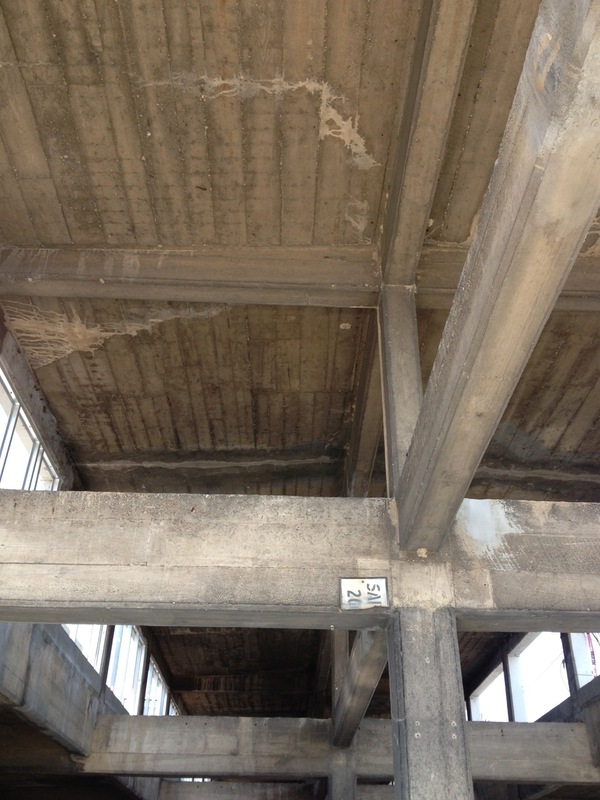 And on the top side of beams you are simply looking at gray concrete because it had never been in contact with formwork. After using a Recyclean to remove dirt and soot, we had three main colors to consider. 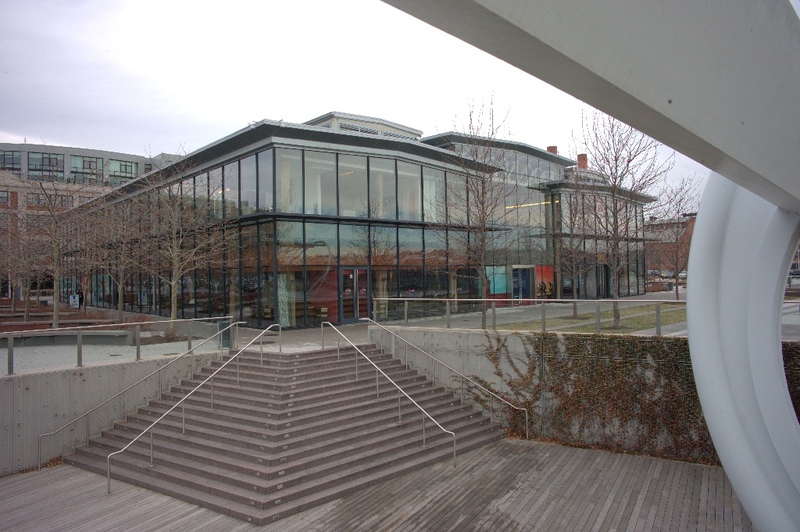 In the end, the tannish-gray (seen in the cleaned band) was selected for the entire space as it most represented the appearance of the oiled formwork. We opted to paint in matte casein so the wood grain would “read” accurately. Coming back to interpretation, this is a perfect example of the technology of that time with what was a relatively new method of building. 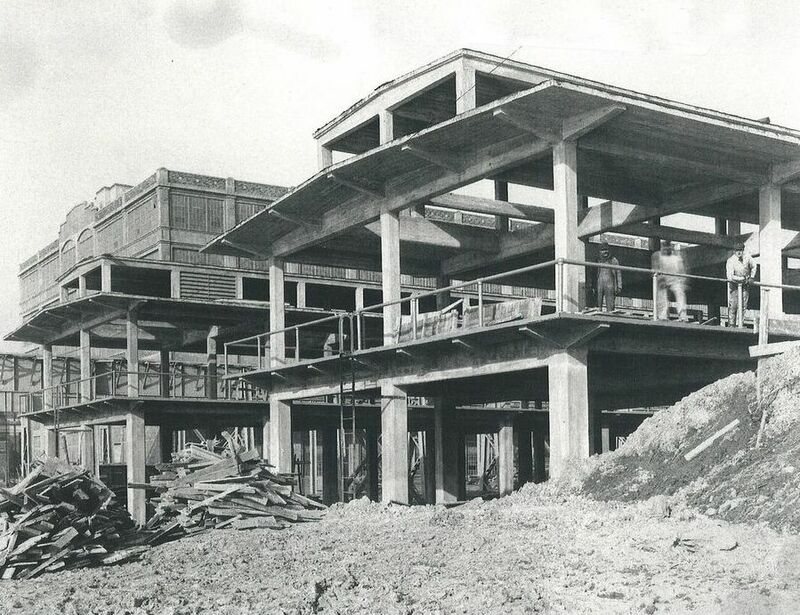 However if we were to interpret the wooden formwork as important to the buildings story, we were presented with the challenge of nearly a hundred years worth of indifferent patches and repairs to the concrete that completely obliterated the board patterns and graining. And the new configuration further complicated the plan by intending to partially enclose some of the upper openings to fit smaller windows using concrete block. Both of these were aesthetic problems to overcome. 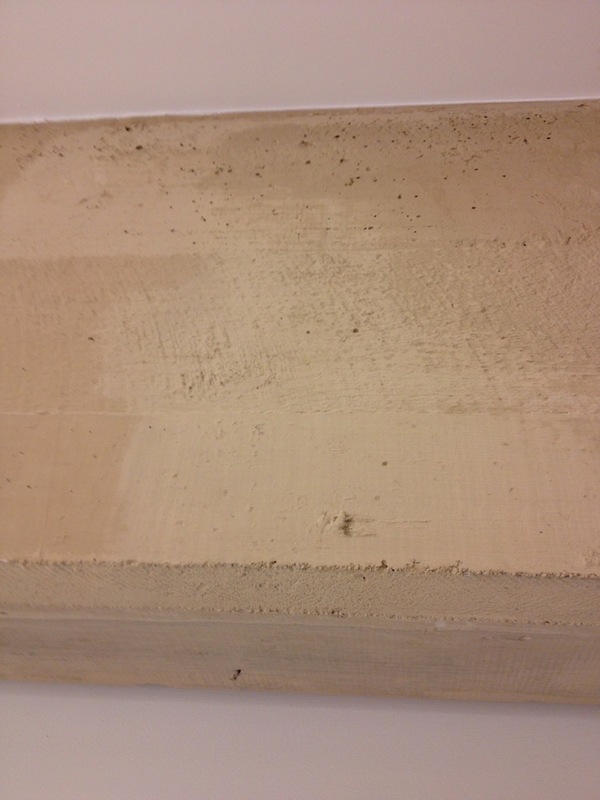 Our initial thoughts were to use paint to faux bois the concrete so even damaged areas would “read” as grained boards. 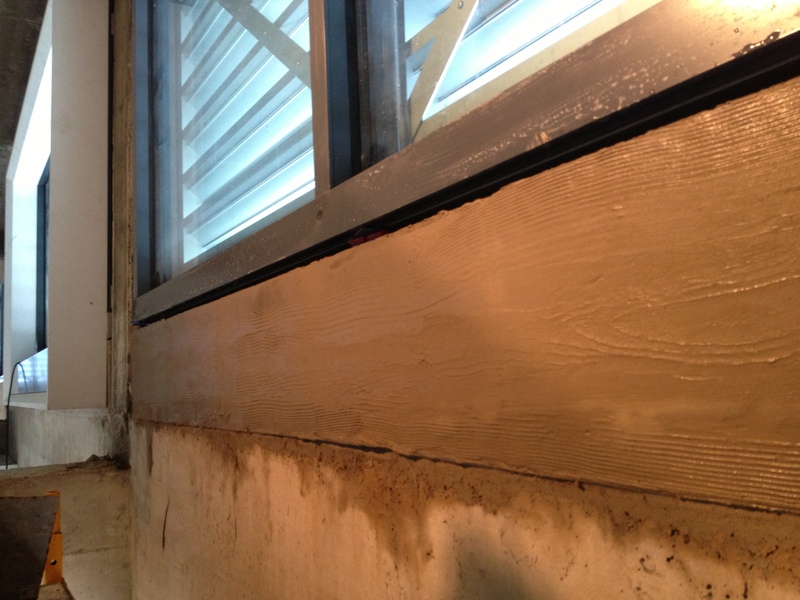 We also tried making silicone rubber molds so we could stamp graining on, but single dimensional lines would not work given the many angles of daylight hitting the walls throughout the day. We eventually concluded that we while we would use faux bois graining tools, they would be used to tool a cement slurry that we could sand or put aggregate into match that particular location that we were graining. A week was spent grinding down concrete patches to the plane of the surrounding wall using a diamond cup grinder. Then we needed to recreate the joints between boards where missing. Finally we had every kind of grain from flat sawn to quartered with knots and every variation in between to figure out how to recreate mid-board to match what remained on either side. And then we had to figure out the timing of adding to this graining the necessary tool marks (circular saw and vertical sash saw marks, as well as planer marks). It took some time to work out the timing, tooling, sequencing and sandedness of each surface – and I can’t say the results were always completely successful. 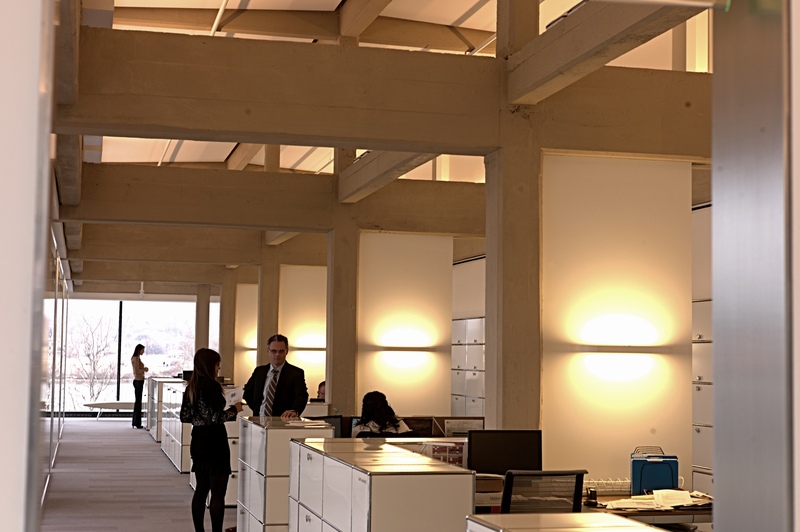 But now every visitor to the space is once again aware of the wooden formwork in every office as opposed to being confronted by the tremendous numbers of patches that existed when we started. How do you interpret and protect uniqueness? There are several stories here. Why preserve things? Why are things from the past important? How do you learn to read their story or listen to them? It has to be a multifaceted undertaking: you have to reach out to the building as it offers up its secrets. You have to make an effort. Concrete is ubiquitous now, but was a new construction material in 1917. Concurrent with this project, we were working on another building constructed in the 1830s by one of Thomas Jefferson’s carpenters where solid timbers make up the post and beam structure. Here, just 80 years later (a single lifetime), is the same post and beam detail but the wood is no longer the structural material. It is now the form for a plastic material (concrete). It took us trying to put what we saw into the context of history or people and building technology, asking why was it there. While reviewing archival sources, we considered what we have learned in the last 50 years of our own work (I remember oiled formwork still existed for certain applications when I first started in the trades). And each time we went back to look at the building, we saw some things a little more clearly and also saw something else we had missed previously. An important tool in understanding buildings is the taking of minute samples for chemical and microscopic analysis. Too often in preservation, sampling is done just to check off a box. Instead, sampling must be part of a question. The results of laboratory analysis can add to the story of what these things were, what has happened to them over their life, and to determine the cause of their current distress. We engaged and made friends with this structure so we could establish a meaningful story which would allow the building to be converted for modern use with an important story of its earlier life remaining for appreciation. If you don’t ask the questions beforehand, you usually lose most of the evidence. 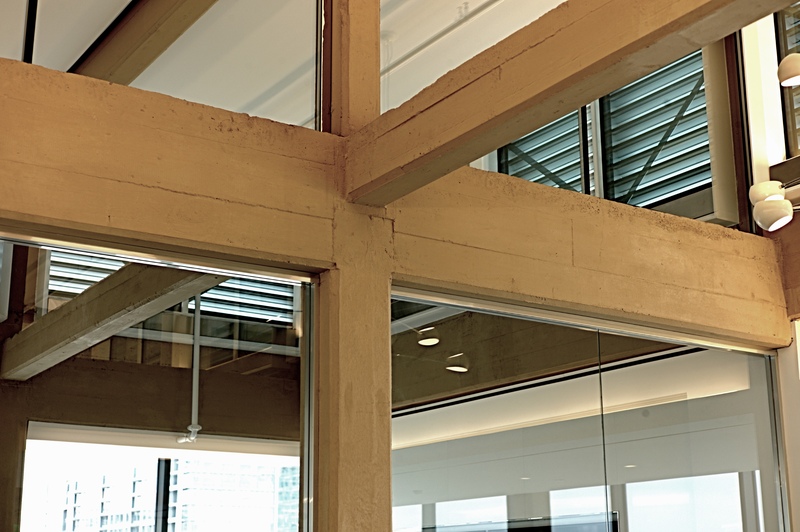 The unique timbers of the this building’s construction are gone (and that caliber of timber largely unobtainable today) but they are telegraphed to the present in the concrete. 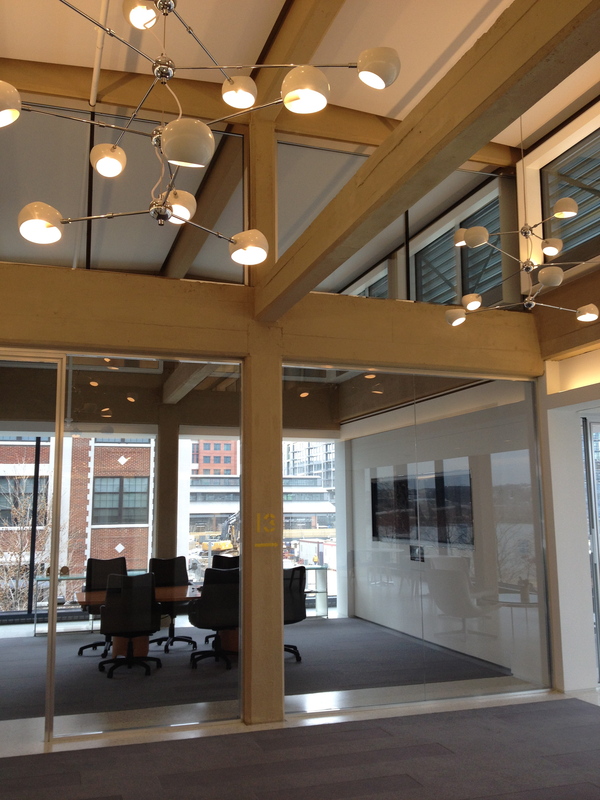 With the beams now exposed within a modern interior, we have an unexpected result: the hard concrete becomes the softening component and the tan-gray paint, created from reds and greens rather than blacks and whites, undulates in tone depending on daylight, shadow, and various temperatures of modern lighting to create a very pleasing appearance. For more information about casein paint on masonry, check out this post. This entry was posted in Mortars, Paint, Plaster and Stucco, Uncategorized, Wood and tagged casein paint, concrete preservation, faux bois for concrete, milk paint. Bookmark the permalink.